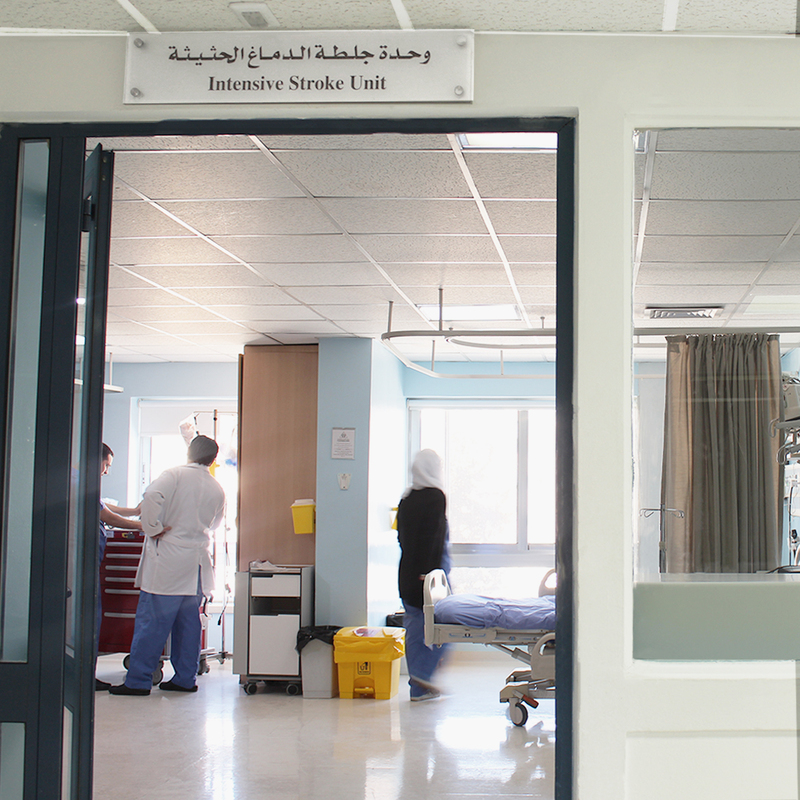 Al Khalidi Hospital & Medical Center inaugurated the Intensive Stroke Unit in 2010. It is the only one of its kind in Jordan dedicated to providing round-the-clock assessment, diagnosis and definitive treatment for brain stroke patients (Cerebrovascular Attacks “CVA”). The goal and challenge of this Intensive Stroke Unit is to improve the stroke treatment standards in Jordan and the region and to be the leader in stroke therapy. Al Khalidi Hospital & Medical Center’s Intensive Stroke Unit comprises specialized physicians and nurses, advanced imaging modalities, up-to-date medical treatment including thrombolysis (Clot Dissolving Agents), and post-stroke rehabilitation services. Our success rates are comparable to similar units in USA and Europe. FACE: Ask the person to smile, does one side of the face drop? ARMS: Ask the person to raise both arms, does one arm drift downward? SPEECH: Ask the person to repeat a simple sentence, are the words slurred? TIME: If the person shows any of these symptoms, act FAST and Call 911 Or Al Khalidi Hospital & Medical Center Emergency Service at the Direct NUMBER (0791990199) so an ambulance (with advanced life Support) can be sent to you.